LIMITED REISSUE OF THE GREAT MEGADEATH’S DEBUT ALBUM ON BLUE SPLATTER VINYL. Megadeth, American thrash metal band led by founder, frontman and songwriter Dave Mustaine. Formed in 1983 following Mustaine's departure from Metallica, As a pioneer of the American thrash metal movement, Megadeth rose to international fame in the mid 1980s Early in 1985, the band was given $8,000 by Combat Records to record and produce their debut album. However, after spending half of that budget on drugs and alcohol, the band was forced to fire their original producer and produce the album themselves. 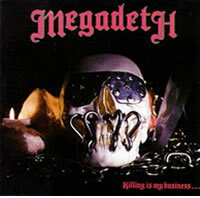 Despite this Killing Is My Business... And Business Is Good!, released in May 1985, was a well-received effort that blended elements of thrash, speed metal and punk rock. Now Back on Black give you the chance to own this classic record on Limited edition blue splatter vinyl.